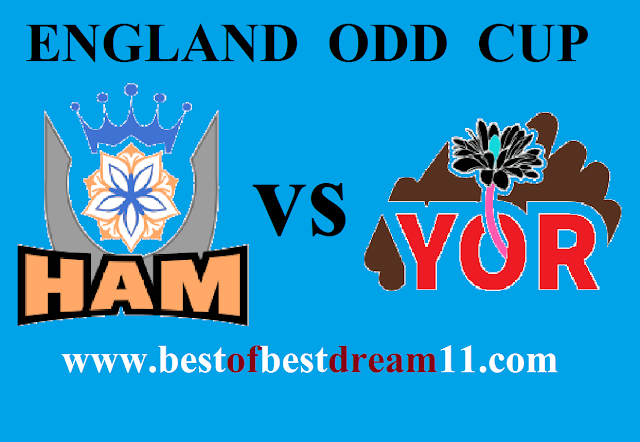 WELCOME to our ''BEST OF BEST DREAM 11'' for HAMPSHIRE VS YORKSHIRE , 2nd semifinal in Royal Landon cup 2018 match dream 11 team. Here is best "HAM VS YOR " T-20 match dream 11 team for the fantasy user who, venue are looking to make a strong team for maximum win. We are providing latest news, match update, information about the match. The team is picked by using various factors on the basis of performance .ground stats and latest form. 1- HAM got the ticket to the semifinal by the ending on the top position in the south group. 2-Yorkshire coach Andrew Gale has named a 15 man squad to take on HAM, he has announced the inclusion of C PUJARA ,Who has returned back to the squad. 3-Mason crane and B TAYLOR will not play tomorrow. 4-For Yorkshire ,TOM K CADMORE,GARRY BALLANCE and Adam Lyth will be the key performers with the bat. 1-GARRY BALLANCE(91 OF 113) AND JACK LEANING (57OF91) were top scorers in the last game for Yorkshire. 2-Cadmore(451run) and Lyth (401run) are top scorer for YOR, in bowling skipper S Patterson take 4 wicket in the last game. 3-Tom Alsop,James VINCE,R Rossouw and L Dawson are the key players of HAMPSHIRE. 4-J Vince make century in the last game against SOM, while Tom Aslop scored 95(103 balls). 5- L Dawson,G Berg and Mason Crane will be the crucial bowler.